It is always disappointing to find out that somehow you have managed to get creosote on your clothes. However, do not despair. There are ways to remove the sticky stuff so that your clothes will be clean again. Do not wash the clothes in the washing machine. If you do not notice the stuff until you have already washed it, then you can still get it off, it will just be a little harder. Treat it like a grease or tar spot and do not let it come in contact with other clothes. The last thing you want is more clothes to scrub. Treat the area with an oil-based substance. Many things will work such as lard, WD-40, butter, chicken fat or olive oil. All of these will combine with the creosote allowing it to lift off the fabric with a clean rag. Wipe in one direction with a lifting motion so as not to smear it into a larger area. Try to wipe in the direction of the threads if possible. Apply a good detergent and some warm water and work the soap into lather on the spot affected. Keep rinsing the rag until the area looks clean. If there are still stubborn bits of creosote, apply a little more of your oily substance to remove it and repeat the soapy wash.
Launder the garment as usual, but in a small load, if possible and check for the stain before drying it. The heat of the dryer tends to set stains so you need to make sure nothing remains before you dry it. If the area looks clean, go ahead and place it in the dryer. 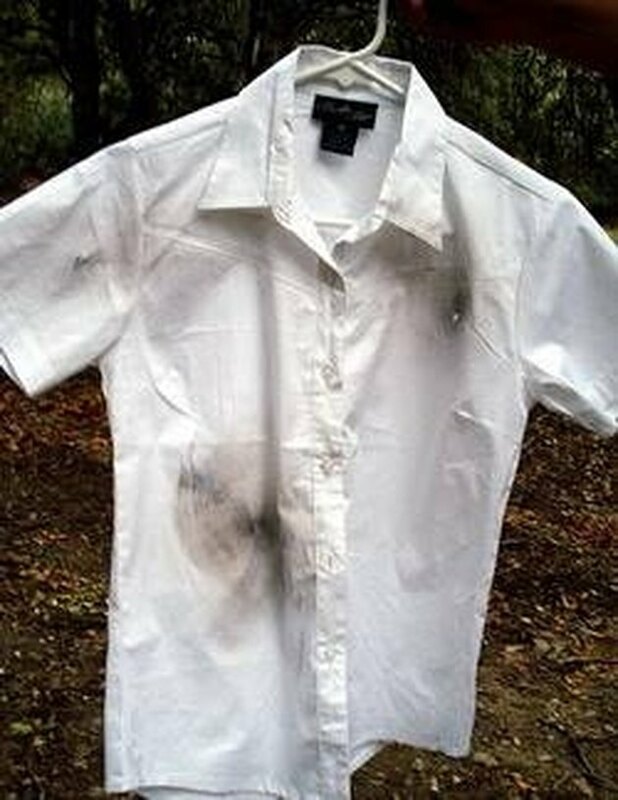 If the clothing is white, you may notice that a little discoloration remains, but if you add a little bleach to the subsequent washings, it should fade.